By default, Drupal appends a colon to the end of field labels. If you would like to remove them and you are already using Display Suite to layout your content types, Display Suite Extras is a great option. My Google searches resulted in countless recommendations to create a custom copy of the field.tpl.php template. Editing templates is fine, but for this use case that seems a bit heavy-handed. Now when you configure your field under “Manage Display” for the content type, you will see a “Hide label colon” option. Using the “Expert” template will provide even more options. In a sea of not-so-great Drupal videos, this stands out. I will be referring back to it many times. I’m trying to limit all of my customizations to the modules or settings, but once in awhile you need to edit a template. Problem: TinyMCE rich-text editor disables the operating system spellchecker when using Firefox or Chrome. Solution: Set the TinyMCE configuration “gecko_spellcheck” to TRUE. In Drupal, you can override this setting by adding an alter function to a custom module. Unable to log into a Drupal site. Logging in with valid credentials would fail without any visible error in the UI. 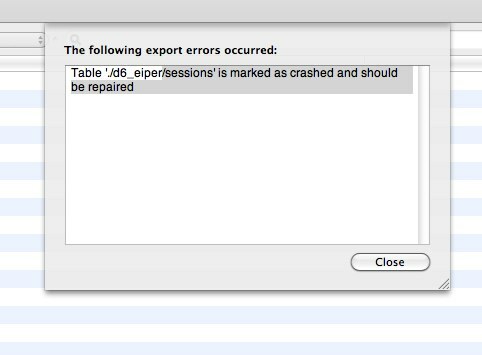 “Table ‘./d6_eiper/sessions’ is marked as crashed and should be repaired’. I was able to do this with Sequel Pro, but you could also use phpMyAdmin. Update 4/6/2012: More tables starting crashing in the same way and we were able to repair them as well. The reason for these crashes is still a mystery. We restarted the web server and haven’t seen any crashes since.